This new Jet Ski from Kawasaki is powered by a supercharged 2 litre engine which produces an amazing 300hp, which makes it the most powerful PWC to date. 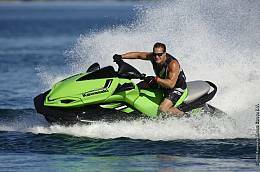 Kawasaki is laying claim to having the fastest Jet Ski in all water conditions, think we would need a battle to confirm this, as the Sea-Doo RXT-X aS is also a beast with a 0-30 mph acceleration time of 1.7 seconds. The Kawasaki owes most of its horses to the new Eaton TVS supercharger. Its claimed this new supercharger delivers a consistent flow of air through the power band to give a smoother response from the throttle. This Kawasaki Ultra 300X monster has been limited in the USA to a top speed of 67 MPH. Once the limiter is take off I�m sure it would be in the 70�s or even 80�s. The ECO mode is a great feature which reduces fuel consumption by up to 15%, even with this economy Kawasaki have still managed to maintain the aggressive power of the Ultra 300X. Kawasaki have moved to an electric throttle on the Ultra 300X which allows for new features such as cruise control and no-wake mode. Combined Stowage Capacity	60 gal.